We went out for breakfast as a group at the Turtle Rock Cafe. Food was well flavored and sustaining. The long walks across campus in the sun and variable cafeteria food reminded me of my Clarion experience in San Diego. It’s interesting how these classes bring back long forgotten high school (sometimes even primary school classes) or science fiction stories that use bits and pieces of physics, hopefully in a somewhat accuate way. Because I’m writing longhand I don’t have as detailed notes as I would like. I think slides will be available online at some time. Andria’s focus of astronomy means that she’s spent most of her time looking at light as a wave. If she was constructing solar sails or something like that she’s spend a lot more time thinking about light as a photon. We went over frequency, wavelength and energy. The energy is related to how the light was created, which is very handy in astronomy. Different telescopes are built for different frequencies. Sadly life is not like the Avengers where all the telescopes in the world can be “set” to gamma radiation (sorry Hulk! )… also gamma radiation doesn’t get through our atmosphere, so telescopes on Earth aren’t built to receive information they can’t get. Everything we know about the universe is through light. Mars rover might be doing physical work on physical samples, but it’s still sending that information back to us via radio waves. 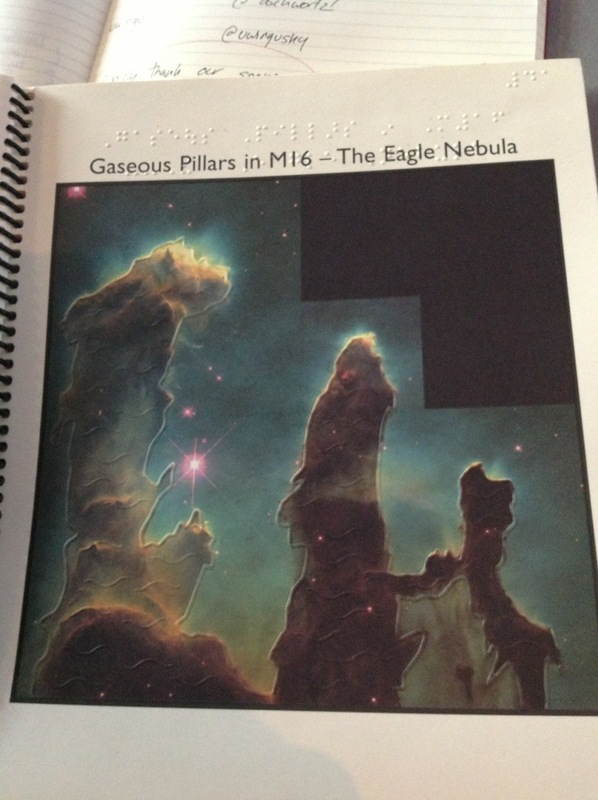 “Touch the Universe” by Noreen Grice is a braille and texture book. While Andria was talking we were able to get information about the universe in a tactile way. The atmospheric window of our planet means that only a narrow slice of the electromagnetic spectrum gets through. Most stuff is blocked out… stuff, Gamma Rays, X-Rays, UV (well, most of it, and more where there’s a pesky hole), IR and Microwave all get thoroughly interfered with by our atmosphere. Visible light and radio waves are the things that get through our atmosphere and so those are the only things our earth bound telescopes look at. We see with visible light. To be able to see with radio you’d need eyes as big as this classroom! (Radio waves are very low energy, low frequency and a very long wavelength). … At this point I couldn’t write any more and desperately needed more than a few hours sleep. Now it’s Thursday. The static we see on our television is a combination of the Big Bang, Jupiter and the Sun. STORY TELLING NOTE: Do not use creative names if Astronomers are involved (Andria is now talking about the Very Large Array). The VLA can be moved around and sometimes has to cross a highway. There used to be a sign that said Telescope Crossing, but that sign got stolen too much, so now it just says train crossing. They move the telescopes in the VLA far apart to capture images and move them closer together for spectra. The Nancay Radio Telescope in France is an interesting beasty made of wire. As computers became more advanced the computers started emitting at the same frequency that the telescope was listening. The telescope was just talking to itself. They had to move the computer hut further away and wrap it in chicken wire. Each part of the electromagnetic spectrum gives us a different part of the story. This stuff above turns out to be amazing and a wealth of information, stripey lines of color will never be quite the same. Emission Line: Light is emitted when an electron goes down a level in the shell. 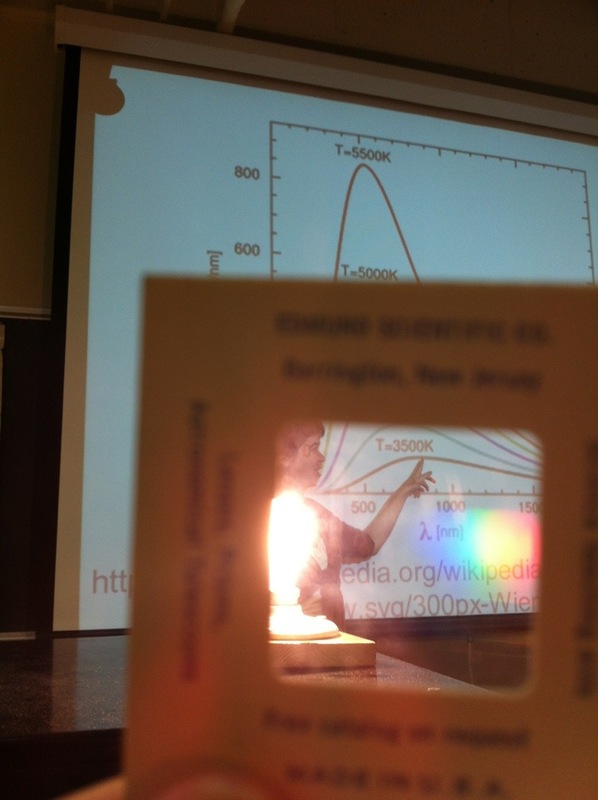 The colors that are emitted are different for each atom and each jump down the ladder of the atoms shell (and maybe molecules too, we were looking at a titanium molecule spectra the next day). 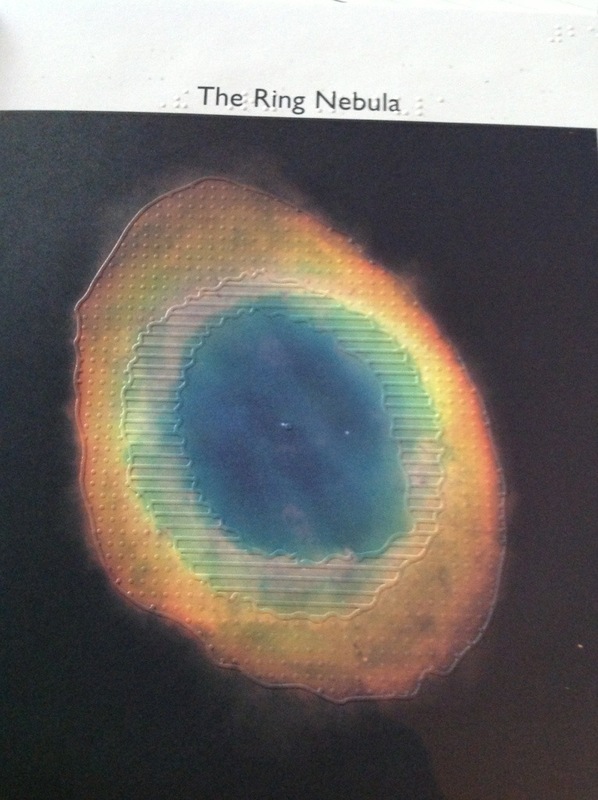 I wrote down a url for a pretty picture, turns out CSIRO has a lot of great astronomical educational resources. Types of Astronomical Spectra. Astronomers often look at graphs rather than pretty pictures, graphs dips and peaks are much more precise. Helium was discovered looking at the sun, hence it’s name (from Helios). Photosphere of the sun is a gas cloud, it runs interference with the black body radiation (continuous emission) of the sun and that interference/absorption gives us an absorption spectra that allows us to determine the composition of the sun’s outer gassy layers. We also did a bunch of hands on work and looked the emissions of various elements (helium, potassium etc). Worksheets were completed and crayons were used. … and that’s a tiny snippet of what happened in the first half of day two, not including excellent lunchtime conversations and such. We’re going for a hike and I should get ready, I shall return and write about Kepler and our evening gazing at stars on the roof.